After some headaches with the screen resize code, I was able to successfully build AMTA as an HTML5 app. I also fixed some typos and grammar issues, and added a way to speed up the text. This makes replaying the game much easier and faster. The next feature should be to make the entire script read from a text file, allowing easy customization and expansion of the story, for people who enjoy modding. It's the ultimate Metroid text adventure. Choose your own path, survive the dangerous caves of planet SR388, uncover the secrets of the ancient Chozo, and take part in the most important event in the Metroid universe. Feel free to discuss the game at the forums. Please be mindful of spoilers. Doc, at last, you've finished it! Congratulations, and thanks for such an amazing work! The game is stunning! It gives a lot of possibilities to speedrunners and sequence breakers. Just a masterpiece! Also the atmosphere is scary as hell! I hope, Nintendo won't try to prohibit this great game, because that's the remake all Metroid fans deserve! Although a small update on the game might make it better. PD. Are some scenes on this game are hints to whats to come? Ha, tha was fun ! Every year, I wonder what your april fool joke will be, and every year I admire all the work you put in. Good job, Doc, you the best ! Although the 3D Metroid thing surpassed this one in the comedic department, this one is more entertaining. I think would fun to put in as a bonus feature for the finished game. Also, I forgot to ask last year how you pulled that 3D thing off. Did it actually update automatically or did you program it to turn to 3D on April 1st for that particular update? GOTY 2016. No doubt. Perfect work, Doc. Just absolutely flawless. This will go great with my boxed copy of Radical Dreamers. I tried using the Magnetic Boots and the Mining Laser on a -1% speedrun out of bounds, but I accidentally permanently returned the game into Other M again. If anyone else has this problem you can get around it by deleting System32 and giving your SOUL to Kraid on a pirate run. Y'know what? I genuinely enjoyed this. Though I couldn't help but feel bad when befriending the newborn creature got it killed anyway but I guess that's because I recently went through Undertale. Other than that, it was a fun game to explore. This is hilarious, I like how you make every typical metroid thing actually kill you. I see a small tunnel, so you would normally think to roll in it with morph ball like you would in an actual game. Or there is a missile red door but that ends up killing you if you shoot it. These really cracked me up. I love it when game developers make fun of their game/video game logic. I started following this project I think 2 years ago. And the first april fools joke was the one about turning it into NES Other M I think. I had no idea you did an april fools joke and I believed everything until I read the comments. That joke hit me hard. Anyways, you are the best Doc and I know you are going to make this the best Metroid game ever. I cannot find the html5 website release. Is it still up? 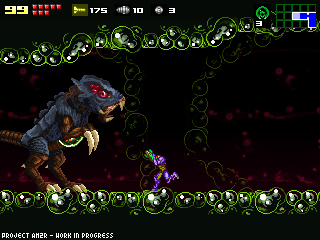 Please make a metroid game with SA-X sprites and making doors explode when you shoot them with super missiles... I always thought that was the sickest thing lol... please? i hate that giant metroid boss in the demo after you beat the other metroid in that labyrinth zone its so hard i still cant beat it there is literally no space to jump around in to hit it and when you get stuff down in those pipes its so annoying is there a trick i dont know about?? ?